A Plot is a scheme where multiple co-plotters cooperate toward a specific goal. Plots are selected by right-clicking the target character or title. 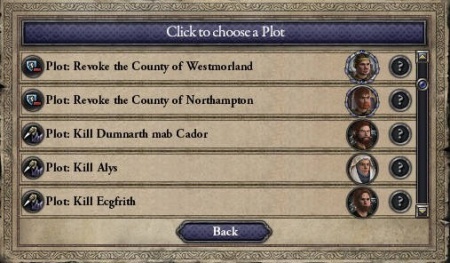 Some plots may also be listed as "suggested plots" in the Intrigue screen. A character can only lead one plot at a time, but can back any number of plots led by others. They can be cancelled, but doing so will often incur a penalty. There is no cooldown to select another. Characters with the incapable trait cannot plot, and characters with the imbecile are restricted from using some plots. Note that this window doesn't necessarily list all characters that can be invited to join. The "Auto-invite backers" checkbox will automatically send invitations to every character willing to join, even if they're not listed here. You will then be able to execute the plot by decision. The Kill Character plot, however, does not have a related decision. The plotters instead get occasional chances of killing the target, which occur more frequently when more plotters are involved and with higher plot power. intrigue plots gain power in proportion to the plotters' intrigue attributes. For military plots by vassals, the plot power of vassals of the target is equal to double the ratio of the available levies of the vassal divided by the levies of the liege. Equal-level rulers as the target who are in the same realm contribute the unmodified ratio. Foreign conspirators contribute one-third the ratio of their levies to the target's levies. For plots by lieges on their vassals, plot power seems to depend on some combination of the plotter's strength relative to their liege and to the plotter's intrigue score relative to the target, but the exact formula is not known. This page was last edited on 9 December 2018, at 07:02.